Nepal is a place of overriding beauty and calm but, as with anywhere, dig a little deeper and the same question will arise: at what price? Responsible tourism issues in Nepal are driven by poverty, a lack of education, and simple inefficiency when it comes to infrastructure. Arrive at the International/Domestic Airport/Bus Terminus, meet and receive by our representative (Khada Welcome) and assist in transfer to the hotel. Welcome with Non-Alcoholic Welcome drinks and check into your rooms, freshen up followed by tour program briefing later drive to Pashupatinath Temple for evening aarati and darshan, post darshan rest evening free at leisure to explore the Kathmandu’s main tourist hub “Thamel” or visit casinos etc O/N stay in Kathmandu. 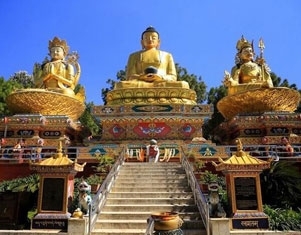 After breakfast proceed for full day sightseeing tour of Kathmandu Valley covering [Boudhanath Stupa, Jal Narayan Temple, SwayambhunathMandir& Kathmandu Durbar Square] evening free to visit the market for shopping etc. O/N stay in Kathmandu.